The slots parlor would be built on the edge of the Suffolk Downs property in Revere. Three years ago, East Boston residents rallied against a proposed casino in their neighborhood, launching a grass-roots campaign that improbably prevailed over a deep-pocketed adversary. Now, the group is gearing up for another fight, this time to block a slots parlor from opening in Revere, just over the Boston line. The ballot initiative, which comes before Massachusetts voters this November, marks the third time in four years casino developers have targeted the area around the Suffolk Downs racetrack, leaving many East Boston residents frustrated and weary. “It’s been an ordeal,” said David Amoyal, among the legion of volunteers in the neighborhood’s opposition to casinos. The slots parlor, backed by real estate developer Eugene McCain, would be built on the edge of the Suffolk Downs property in Revere, which votes on the plan Oct. 18 over the objections of city leaders. 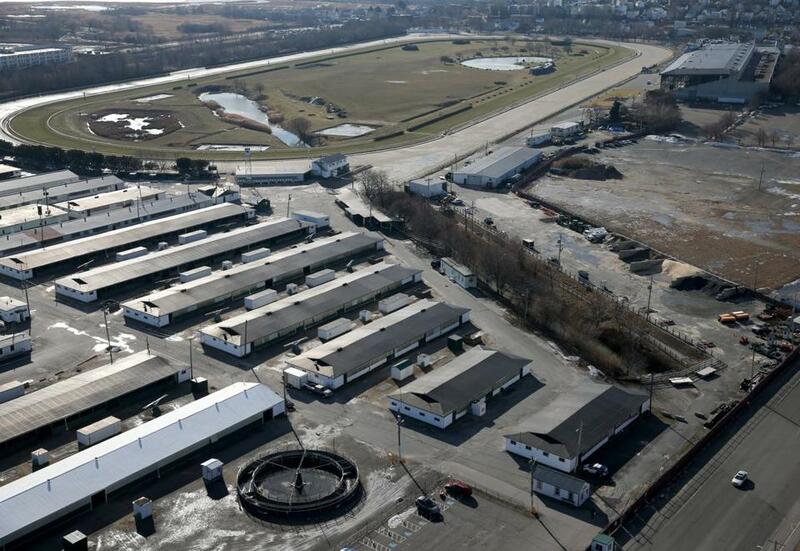 It would replace a rundown trailer park just off Route 1A; the racetrack’s owners are not involved. If approved in November, the casino would require the approval of the state Gaming Commission, which has expressed skepticism about the idea. But East Boston residents say they want to defeat the plan at the ballot box to send a message that casino opponents remain a viable force. Last week, a group of East Boston residents, veterans of the 2013 campaign, met in a church hall to form a committee against the slots parlor referendum, known as Question 1. Myers also led an unsuccessful campaign in 2014 to repeal the state’s 2011 casino law. But she said the law was wise to allow only four licensed gambling facilities — three destination resort casinos and one slot parlor. Expanding gambling beyond that, she said, would only open the door to more proposals. “Don’t undo what’s already been done,” she said. So far, the McCain group has raised more than $400,000, while opponents have only $50 on hand, according to public records. In 2013, casino proponents spent about $3 million, while opponents spent about $50,000. McCain, through a spokesman, declined to comment. East Boston opponents had hoped the casino issue had been settled. In 2013, 56 percent of East Boston voters rejected a casino at Suffolk Downs, a decisive margin that seemed to put the matter to rest. In 2014, Mohegan Sun came forward with a nearly identical casino plan for the Revere side of the Suffolk Downs property, which straddles the border with East Boston. For Amoyal and other volunteers who had spent countless hours fighting the Suffolk Downs proposal, it felt like a betrayal, and three months later, Revere voters overwhelmingly backed the $1 billion project. The Revere casino ultimately lost its bid for the Greater Boston license to Wynn Resorts, which is now building a $2.1 billion casino in Everett. Residents there approved the plans by an overwhelming 86 percent, and East Boston opponents thought they were home free. “I thought we had no more worries after that,” Amoyal said. The owners of Suffolk Downs said they had abandoned the idea of a casino, and were considering other development options for the property. Even if the ballot measure is approved, the proposed slot parlor faces an uphill climb. Stephen P. Crosby, chairman of the State Gaming Commission, has said awarding more casino licenses would be unfair to the developers who won licenses under the original rules. Three casinos have received licenses. Plainridge Park Casino in Plainville opened last year as the state’s first slots parlor, while Wynn Resorts plans to open its Everett casino in 2019. MGM is now building a $950 million casino in Springfield that is due to open in 2018. Peter Ubertaccio, a political scientist at Stonehill College in Easton, said a shortcoming of the state’s casino law is that bordering communities have no direct say on projects, even though they inevitably absorb some of the impact. City Councilor Salvatore LaMattina, who represents East Boston, said that casino opponents will continue their campaign. It wouldn’t make much sense to stop now, after all. Correction: A previous version of this story incorrectly referred to the wrong ballot question. The slots parlor referendum is known as Question 1.